Did you have the Dinky die-casts? I had both the Eagle freighter and transporter, and combined the cabin from one with the chassis of the other to make one authentic-looking all-white Eagle! I see replacement parts on ebay all of the time for this ship. You should be able to score some new ones. I have this as well as the Moonbase Alpha playset. 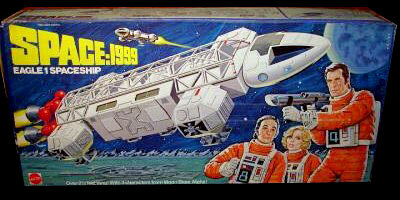 Space 1999 was always my favorite, followed by BsG. One day I will buy an orange six-wheel "rover" and drive around town in a spacesuit. I know modelers have made awesome Eagles over the years, but anything nicer than a battered toy costs a mint. Alas, I can't find the link for it in my bookmarks, but a few years ago a guy did buy one of these for his brother, but only gave it too him after extensively rebuilding and repainting it so it looked the real thing instead of a plastic toy. He posted a step by step of the 'restoration' on his site. Beautiful work. I proudly have one of these babies hanging from the ceiling in my "geek room". It's actually the second one I've owned... procured - with it's figures and relatively in-decent-shape box - from a comic book shop in 1994. It is unfortunately missing the little stun guns, laser rifle, and most of the helmets and backpacks, but otherwise looks very nice. I've also replaced the tattered old stickers and decorated it a bit more extensively with one of those sets of repro decals and interior bulkhead inserts which can be found on the internet. I still have my Eagle, including the box, though my Eagle also saw a lot of outdoor adventure play and is a little worn for it: I lost two of the four stun guns, and the white plastic is a bit dirty. (The glue Mattel used to assemble the toy has yellowed over the years, but that's a problem common to that toy, I've heard.) I also did some custom painting of the black anti-glare panels in the command module, and did a little detail painting on the control panels, the astronaut chestpack and the figures' hair & eyes, but have not obtained after-market decals to replace the yellowed & fading Moonbase Alpha logos. Here in good ol' Great Britain in the Seventies this was THE show on the telly for sci-fi. In fact it was my introduction to the genre. My older brother had the small diecast Eagle but we broke it in a 'space battle' with the diecast Enterprise that fired small round orange plastic "photon torpedoes". I miss my childhood ...! I used to have one of these too. Man this brings back some good memories. WOW.. I'm surprised I haven't commented on this yet (didn't see this column obviously..). As everyone here knows (I'm sure), both Yr1 of 1999 and BSG (ok, Quark too) were my all-time fav 70s shows. My childhood friend had bought the Mattel 9" figures and Alpha, but I never had a chance to play with this as a kid (I know my parents would never have purchased this, nor would I have enough money saved up to buy myself..). The Eagle's my most favorite ship ever. Jump ahead to the early 90s, I started attending some antique toy markets around the mid-west, and some one had this showcased under glass. So I finally hunted down a decent one on eBay and LOVED IT when it came in. It had all the weapons, loose parts, etc (no box unfortunately..), and I had seen a few sites where folks took 'em apart, spray-painted, improving on the realism etc.. I decided to just stay with it looking 'like a toy' without repainting the hull or red engine bell assembly, so yes, mine still has some of the yellowed glue, but there's a GREAT canadian modeler's site with awesome water-based slide-on decals for 5-6 differnt scales (including the 24") which included space suit backpack decals, etc..
YOU WILL NOT BELIEVE YOUR EYES with how awesome it makes the set look. I still have to hang it somewhere, but it's the still holds the 'Coolest Toy In My Collection' status in my humble abode. One of the best sci-fi ships of all time; I still want to get my hands on a replica of one. I so wish I still had my Eagle. Alas, it literally got played with to pieces. One too many crash landings in the sandbox, but lots of good times. The great thing about this toy was I don't think I ever even saw the show until I was way older, and I didn't learn to appreciate it until I was in my 30's. The fact that it was even part of a show didn't matter to me, it was just FUN! For my 10th birthday in 1977 I received Two (2) Eagles. Apparently the local TG&Y had the Eagles priced reduced to sell and Two (2) of my Uncles each gave me one. Sadly, like every 10 year-old, I played with both Eagles till the plastic broke and the figures were lost. Five (5) years later when my little brother turned 10 years-old, our Grandmother gave him one for his birthday mistakenly thinking it was a G.I. Joe toy. Hey Ted, you wouldn't happen to be from Louisiana? "Ted Harrington" is the name of my first cousin, who would be your age and who has a younger brother, Peter, five years younger than him. I don't recall Cousin Teddy have an Eagle 1, much less two, though! I had this toy too. Got it for Christmas, probably around 1976. I'd only seen the program once or twice because it didn't air regularly, so I was only vaguely familiar with it. I lost the stun guns almost immediately. I kept it for years, finally tossing it out with all of my other toys when I became a teenager. This was one impressive toy. This, Star Trek and Planet of the Apes Mega figures - Talk about parralel lives! -=sigh=- Oh, this takes me back. I had a childhood friend that lived across the street from me that had one of these. I remember playing with and having Star Wars and Micronaut figures ride inside it. I really want one of these for my own. The more time goes on, the harder these are to find and the more expensive they become. Thanks for sharing those great memories! Time goes so fast I wish going back to those good 70's childhood years! Chris from Ste-Julie, Quebec, Canada.